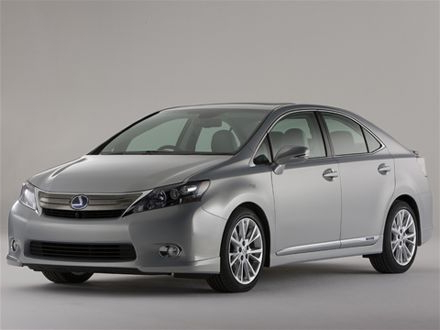 Since Lexus is Toyota’s luxury brand division, there has always been talk of upgrading the style and luxury of the hybrid Toyota Prius for the Lexus buyers. Well, the 2010 Lexus HS250h is probably the closest thing you will see to this idea being realized. The HS250h is a fine looking automobile that offers a more formal sedan body instead of the usual 5 door hatch back that the Prius is known for. In addition, the HS250h is well sized for a Lexus hybrid- right in between the IS and ES models. In fact, the HS250h is built on the same platform of the Prius, but is definitely higher in its shape. In the same tradition, the HS250h offers fine aerodynamics with one of the best drag coefficients around. While there is plenty of technology under the hoods, since this model is still being worked out, plenty of its final numbers haven’t been stated directly to the press. However, you will find a very capable engine that delivers a total of 180 horsepower- which is surely enough to power the vehicle on the highway entrance ramps and around town. The interior is finely done with plenty of touches to accent the “green” nature of the vehicle. And for the most important number- the fuel economy, you can rest assured that the HS250h will please the many that are looking for an upscale Prius. While final numbers aren’t in yet, the Lexus HS250h is expected to have a fuel economy of about 30 percent more than a traditional Lexus of this size. Again, price details haven’t been offered as well, but expect it to be a very small premium above what the normal cars in this class cost. However, once the info does become available, we will keep you updated.